"There is a massive desire for change out there." Liberal Leader Justin Trudeau says Prime Minister Stephen Harper has "changed the rules" to give himself an advantage in the coming election. Harper is expected to call an election Sunday for Oct. 19 — setting off the longest Canadian election campaign in modern times. The Conservatives&apos; Fair Elections Act provides for higher spending limits in longer campaigns, and Harper&apos;s party has more cash on hand than the opposition parties combined. Trudeau told CBC Radio&apos;s The House that Harper has "changed the rules so that he&apos;s able to spend more money than we&apos;ve ever had in an election." Even so, Trudeau predicted that voters won&apos;t be swayed by a blitz of pro-Harper advertising. "Well, he&apos;s going to have an advantage in the spending, but I still believe that Canadians can&apos;t be bought by deeper pockets," Trudeau said, adding that "there is a massive desire for change out there." 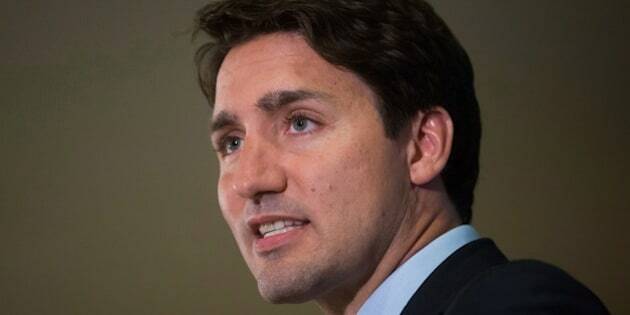 While he&apos;s running third in recent polls, the Liberal leader also stuck to his rejection of a coalition with the NDP as a means of unseating Harper in the event of a minority Conservative government. A new Forum Research poll found that 68 per cent of Liberals and 75 per cent of New Democrats favour such a coalition — in all, about half of all Canadian voters. Trudeau, however, insisted that "one of the things I&apos;m not going to do is reduce, either implicitly or explicitly, options at the ballot box. That&apos;s why I&apos;ve said no to a formal coalition." "We are always open to working with any parties after an election to pass the right kinds of legislation," Trudeau said. But he rejected what he called "a formal arrangement" given differences with the NDP on the economy. Asked whether that excluded an "informal" one, Trudeau responded by sharpening his attacks on NDP Leader Tom Mulcair, who&apos;s been leading in the polls. Trudeau said "the NDP have fundamentally misread the economy." He also faulted Mulcair for conflicting statements on the question of a coalition. "Mr. Mulcair has been saying a lot of different things over the past months on this subject. In French, in Quebec, he unequivocally, absolutely ruled it out. A couple of weeks later, in English, he says he might be open to it. He&apos;s playing a very dangerous game, trying to pander to what people want to hear in different parts of the country." Saying he had "fundamental disagreements" with the NDP on economics, Trudeau added that, "I&apos;m not going to short-cut or short-circuit or figure out how we can win at all costs by making all sorts of arrangements. I&apos;m focused on presenting the best possible plan to Canadians and let Canadians make the choice of the kind of government they want." The Trudeau interview airs during The House, Saturday on CBC Radio One at 9 a.m., 9:30 a.m. in Newfoundland.